A man in central China has been arrested by police for killing dogs with poisoned syringes and attempting to sell their meat. 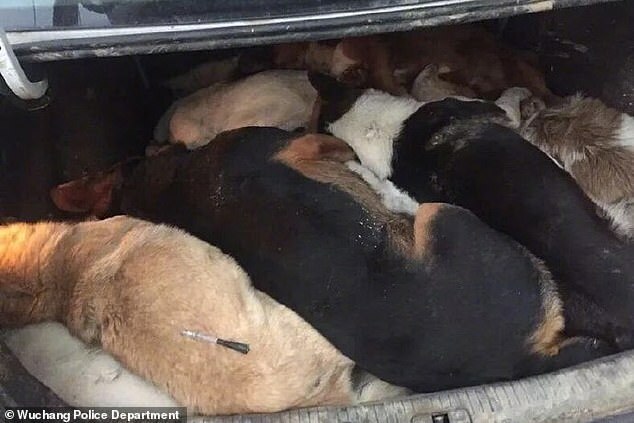 Police in Wuhuan city, Hubei province discovered at least 10 dog carcasses stuffed into the trunk of the suspect’s vehicle, along with a large crossbow and three bags of poisoned darts. The suspect, surnamed Dai, later told police he killed the dogs in a remote village and was transporting them to dog meat vendors. 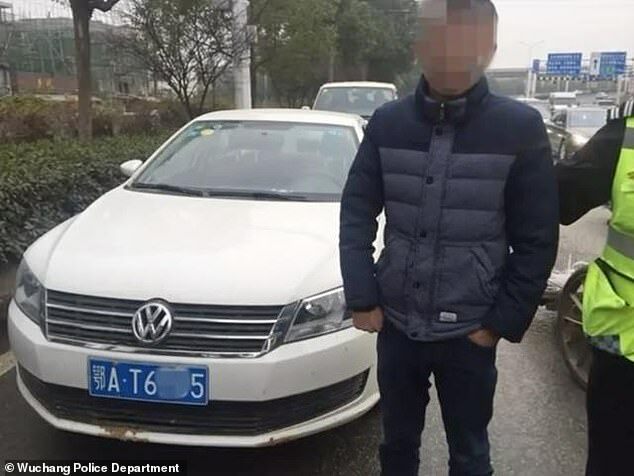 The man’s white saloon got the attention of traffic police as the car was fitted with a number plate that belonged to a different car model, according to Wuchang district police. Officers were dispatched to investigate the vehicle on December 11 at about 4pm, according to officer Ou Xiaolong. However, the driver appeared very nervous and refused to open his trunk for police inspections. Several minutes later, the man locked his car and attempted to flee the scene, prompting officers to stop him by breaking the driver’s side window. 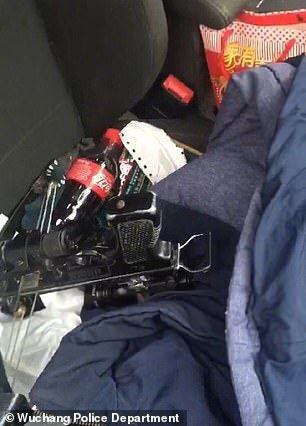 Video footage of the incident shows police officers inspecting the man’s vehicle when they made the horrific discovery. 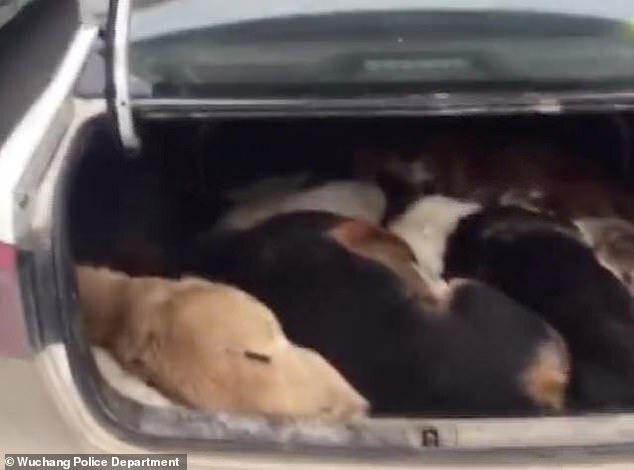 The clip shows the carcasses of around 10 dogs stuffed in the trunk and a large crossbow on the passenger seat, with several hundred poisoned syringes scattered on the floor. One of the dead dogs still had a dart stuck on its rear. Based on previous similar cases, these darts are usually modified syringes fitted with a spring and a tailfin at the end so they can be shot from the crossbow at a distance. The syringes contained a dose of the muscle relaxant suxamethonium that was large enough to kill the dogs instantly, according to Xinhua news agency. The man admitted to killing the dogs with the crossbow and poisoned darts. He told police that there are more people consuming dog meat during the winter and thought he could make some money by selling dog meat to vendors, according to Hubei Television. 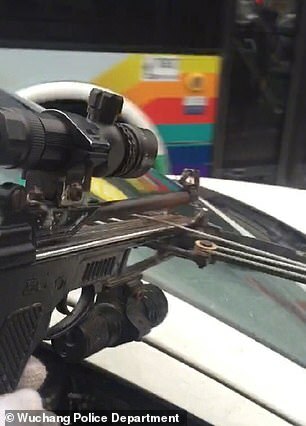 Dai purchased the crossbow online, rented a car and fitted it with a different number plate to commit the crime. He has been detained for five days amid ongoing investigations, police said, adding that the dogs had been buried. Consuming dog meat is not banned in China. However, stealing dogs and selling poisoned dog meat is illegal. Dog meat is a popular delicacy in some areas of China, particularly in Hunan, Zhejiang, Guangxi and Guangdong provinces. It is estimated that 10 million dogs are slaughtered for their meat in China every year as many believe that it is a health tonic. However, recent concerns about animal cruelty have seen the trade diminish as activists and global rights groups campaign laws to ban dog meat consumption. 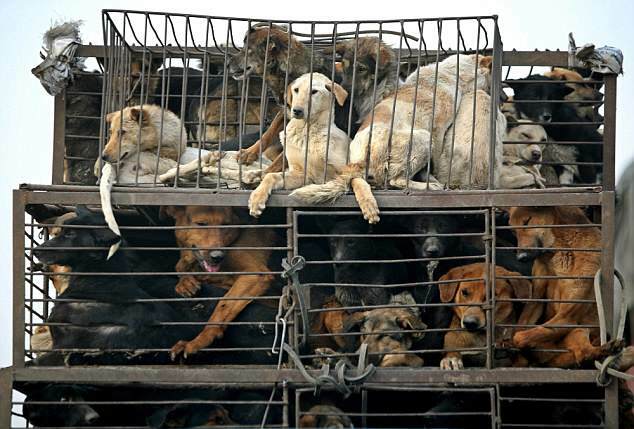 Why do people eat dogs in China? It’s not uncommon to see people eating dishes made with dog meat in southern China, especially in the provinces of Guangdong and Guangxi. 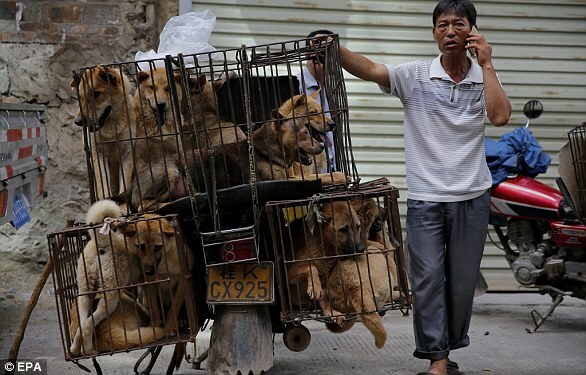 The city of Yulin, in Guangxi Province, has an annual dog meat festival every year on the summer solstice. Keith Guo, an animal lover working for PETA Asia and a native of Guangdong, southern China, said dog stew was common in Guangdong as well as the neighbouring Guangxi Province. Mr Guo, 27, who has a passion for food sociology, explained that meat from dogs smelt and tastesd gamier compared to other types of meat, so chefs usually used spices such as chilli peppers and ginger to cover the odor. As a result, dog stew is heavy and could warm up the diners’ body quickly. Mr Guo added that the weather could get humid in southern China during winter, and according to traditional Chinese medicine, humidity could weaken one’s health. That’s why locals like eating warm dog stew to boost their immune system. Mr Guo said he lost five pet dogs to dog thieves when he was growing up in Guangdong. He condemned the thieves’ behaviour.